The canine ear is an important organ, as it is related to special sensory functions such as hearing and the positioning equilibrium of the dog. Outer ear: The outer ear of a dog consists of two different components. The ear flap or outer covering is called the pinna and works to protect the ear. The inner surface of the pinna at the base contains cartilage which not only concentrates different sounds, but also acts as a shock absorber. The other part of the external ear is the tubular canal which extends in to the inner parts of the ear. In dogs these tubular canals are relatively longer in length and form complicated curves, some of them 90 Degrees at the axis. Different muscles related with the outer flap of the ear helps in the mobility of the pinna and helps to localize different sounds for the tympanic membranes. Middle Ear: The middle ear consists of a continuation of the tubular canal. Also, three different membranes, called the tympanic membranes are also included in the middle ear. These membranes are also called “ear drums”. 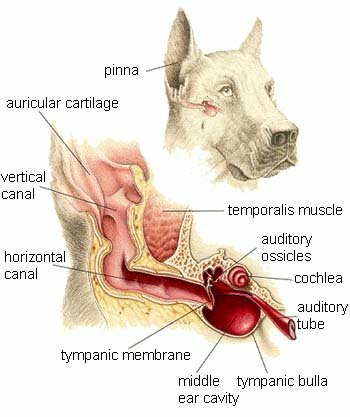 The middle ear also communicates with the pharynx and larynx in the throat through auditory tubes, which maintains the pressure of sounds released by the dog. Three auditory ossicles or bones also exist in the middle ear, which helps in the amplification of different sounds delivered to the ear drums. Similarly, attachments and movements of muscles in the middle ear control sound pitch, thus loud and sharp sounds are damped before ending up at the ear drums. 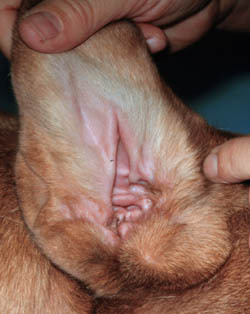 Inner Ear: The inner ear lies in the deepest portion of the canine ear. The inner ear has two parts, one related to positional equilibrium and the other specified for sound processing. This part of the ear is contained in an evacuated cavity, and has a rich supply of different nerves and tubules. Different components of the inner ear perform various functions for processing and identification of different sounds. Once a sound is transmitted to the inner ear in the form of vibrations created by the ear drums, motion displaces “peri lymph” in the inner ears. Peri Lymph is an uncompressible liquid that transmits sound waves to the next part of an inner ear, called the “scala vestibulli”. On stimulation, corti is another part at a distance from the scala vestibulli, which stimulates other components and an “oval window” of the middle ear, thus a nerve impulse is generated at the end and then the “vestibulocochlear nerve” transmits this stimulation to brain, which identifies the sound. The inner and middle ear is also referred to as the canine ear canal. The canine ear is a favorable environment for the growth of different pathogens, allergens and parasites. Inflammation, yeast infection and other types of infections. These commonly occur in both the external and internal parts of the ear and can cause canine ear swelling. The external ear can be affected by canine ear problems such as pinnal dermatitis, flea bite allergy, stable fly strike, mite infestation, ear margin dermatoses, frost bite and ulcerative dermatitis. These conditions may be infectious or non infectious. Internal parts of a canine ear can be affected by otitis media (infection of the middle ear) and problems in the internal cavity, which includes canine ear problems such as cancer, flea infestation and some fungal infections. Some non contagious ear problems like those related to congenital and non congenital deafness, progressive degeneration of internal cartilages and soft bones due to a deficiency of minerals have been reported in dogs. 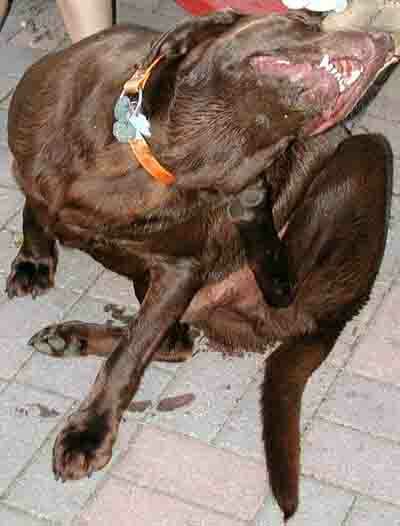 A common symptom is a dog scratching ears or ear itch. This is often caused by mites and fleas. A dog that scratches the ears more than 6x per day is thought to have some type of underlying canine ear problem. Another sign of a problem is canine ear wax buildup. Ear wax should be yellow/brown in color with excess volume removed during a routine ear cleaning. If too much dog ear wax builds up, it can lead ear infection and other problems such as hearing as the delicate balance of the ear is disturbed. A detailed physical examination can possibly reveal the condition of the ear. For confirmation of some conditions as cancers, otitis media (infection) and fungal infections in the inner ear requires detailed laboratory procedures such as biopsy, culturing and isolation. Radiographs are another effective tool for studying different deformities in the ear. Several treatment options require the use of canine ear medicine such as antibiotics, steroids, anti fungal drugs, anti parasitic preparations. Sometimes surgery is required depending on the diagnosis. Medications are either given orally or applied topically. Bacterial canine ear infections are treated with antibiotic drops or ointments Underlying conditions such as fungal infections, parasites and allergy are treated with medications that are indicated for each type of condition. These can be supplemented with home remedies canine ear infection. Dog ear mites can be treated with home remedies for canine ear mites, herbal preparation or a prescription medication. If after home treatment the condition worsens, see a veterinarian. A mite infestation usually occurs in dog's with a weakened immune system. Mites often reappear after a home treatment, since home approaches only treat the outer ear, with any mites in the inner ear, left untreated. Canine ear care is necessary for preventing the described conditions. Regular dog ear cleaning with a quality canine ear wash and watching out for any problem in the ear during the initial stages of a problem can help to prevent possible incurable ear problems. A homeopathic product such as Ear Dr. can be an effective natural approach for cleaning canine ears, soothing and conditioning the ear to prevent scratching and itching, plus it is a way to promote complete ear health. Ear wax levels should also be kept at normal levels. 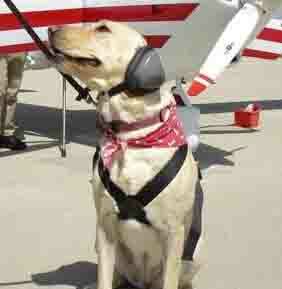 Canine ear plugs are often used to provide a level of canine ear protection, particularly during flying. The most popular style is a over the ear product such as Mutt Muffs Hearing Protection for Dogs. Mutt Muffs provide dog ear protection in planes, at firing ranges and other places where the ear can be harmed by noise or debris. Some ear problems are reported to occur due to the mishandling of the ear during grooming. So only experienced professional groomers should only attend to the inner parts of the ear.